Evaluation of the bone marrow response is an initial step in characterizing an anemia. If the bone marrow is responding to an anemia, then the anemia is classified as regenerative and the cause of the anemia is hemorrhage or hemolysis. A bone marrow or regenerative response is assessed by identifying immature anucleate red blood cells (RBC) in peripheral blood. Species differ in their regenerative response (both the degree and the types of immature red blood cells they release) and these differences must be taken into account when determining if an anemia is regenerative or not. In general, immature anucleate red blood cells contain more protein synthetic machinery (ribosomes, RNA) than mature red blood cells. This RNA can be detected using various dyes, including intravital and fluorescent dyes. Intravital dyes precipitate the RNA, whereas fluorescent dyes bind to RNA, allowing the RBC containing RNA to be identified. RBC with sufficient RNA to be detected by these methods are called reticulocytes. When the immature RBC contain large amounts of RNA (called aggregate reticulocytes), they can be identified in regular Romanowsky-stained blood smears, without the use of special dyes to detect the RNA. This is because RNA typically stains blue, whereas hemoglobin stains red in Romanowsky stains. The large amounts of RNA in aggregate reticulocytes is sufficient to offset the red of hemoglobin, imparting a purple color to the cytoplasm of the immature RBC. This is then called a polychromatophilic RBC (or polychromatophil) and the change in RBC color is called polychromasia (and is subjectively semi-quantified in a blood smear as mild, moderate or marked). Thus, a regenerative response can be evaluated to some degree in a regularly stained blood smear. Note, that immature RBC that contain only small amounts of RNA (called punctate reticulocytes) or no RNA will not be detected in a regularly stained blood smear, because the cells are a normal red in color. Such cells may or may be larger than normal RBC (if they are larger, they are called macrocytes). Thus, polychromasia will under-estimate the number of reticulocytes, because we can only detect aggregate, but not punctate, reticulocytes in a regular Romanowsky stained blood smear. We can more accurately count reticulocytes (as a percentage of total RBC and as an absolute reticulocyte count) in dogs and cats (although different reticulocytes are counted in dogs versus cats; see below). Reticulocyte counts are not that useful in other species. Immature RBC may also be larger and have less hemoglobin, than mature cells, but these features are not relied upon to identify immature cells (because abnormal bone production can also result in these changes). Equine species are an exception to this rule. Although they can release reticulocytes (punctate) in response to an anemia, there are usually too few of these cells to identify in peripheral blood reliably. Instead, they appear to retain immature RBC in the bone marrow until they lose most or all of their RNA and release larger cells (macrocytes) instead (see more below). Basophilic stippling: Precipitation of RNA or ribosomes in RBC that is identifiable as blue chunks in RBC. Nucleated RBC (nRBC): Different variants may be seen, but in mammals, the most common nRBC seen in blood in animals with a regenerative anemia (or other causes of increased nRBC such as marrow injury) is the metarubricyte (fully hemoglobinized nRBC). 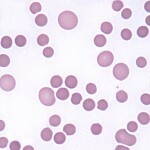 Howell-Jolly bodies: Nuclear fragments or micronuclei. Note that none of these above three features alone, or even in combination indicates a regenerative response, since other disease processes can result in their presence in peripheral blood (in the absence of a regenerative response or even an anemia), e.g. lead poisoning (basophilic stippling, nRBC), altered splenic or marrow macrophage function (nRBC, Howell-Jolly bodies), bone marrow injury (nRBC). Also, the absence of these features does not mean the anemia is not regenerative (this is based on the presence of reticulocytes or polychromasia in most species, except for the horse, where we look for macrocytes). Anemias without sufficient numbers of immature anucleate RBC are termed non-regenerative and are due to conditions which decrease the production of erythrocytes by the bone marrow. Remember, that the bone marrow takes 3-5 days to respond to an anemia, so an acute onset anemia may initially appear non-regenerative. 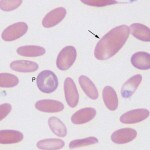 Estimate the degree of polychromasia in a blood smear: The degree of polychromasia is subjectively assessed as mild, moderate and marked and, in a routinely stained blood smear, is a good guide as to the regenerative response (because polychromatophils correspond to aggregate reticulocytes) but will underestimate the reticulocyte count (or percentage) because punctate reticulocytes will not be polychromatophilic (they may, however, be macrocytes). Count reticulocytes: Both punctate and aggregate reticulocytes (which are thought to have the same lifespan, varying between 1-2.5 days) are included in reticulocyte counts in dogs. Reticulocytes are counted as a percentage of total RBC and a reticulocyte count above the reference interval is called a reticulocytosis. If an anemic dog does not have reticulocytosis, the anemia is either non-regenerative or the onset has been too recent (within 2-3 days) for a regenerative response to be evident in blood. If an anemic dog has reticulocytosis, it must be determined whether the increased percentage of reticulocytes is sufficient to indicate that the bone marrow is responding appropriately to the anemia, i.e. is due to an actual increase in erythropoiesis (and not just a relative decrease in the number of mature RBC). This can be accomplished by calculating an absolute reticulocyte count, corrected reticulocyte percentage, and reticulocyte production index. The absolute reticulocyte count is the most commonly used method to assess the adequacy of regeneration at Cornell University. Macrocytes: These may accompany the polychromatophils (and are likely to be punctate reticulocytes in this setting), but their presence alone (in the absence of polychromasia) does not indicate a regenerative response in the dog. Basophilic stippling in nucleated and anucleate RBC: This is infrequent. To assess the adequacy of the regenerative response in relation to the severity of the anemia, several formulas can be used, which take into account the severity of the anemia. * This is based on the upper limit of the reference interval for absolute reticulocytes established in the Cornell University Clinical Pathology Laboratory and may change when new intervals are established. Reported reference intervals for CRP are < 1% in the dog and < 0.4% in the cat. An RPI of 1.0 reflects a normal rate of red cell production. Values greater than 1.0 indicate increased production in response to anemia. In cats, aggregate reticulocytes mature into punctate reticulocytes within 12-24 hours; punctate reticulocyte circulate for at least several days (7-10 days) before all the RNA is lost. The reticulocyte count in cat blood should only include the percentage of aggregate reticulocytes; punctate reticulocytes are not included in the standard reticulocyte count at Cornell University because they do not reflect the most recent bone marrow response (e.g. an anemic cat with only punctate reticulocytes is not actively regenerating at this time, but has shown some bone marrow regeneration in the past 7-10 days). Other laboratories may provide both punctate and aggregate reticulocyte counts in cats. At normal hematocrits, few reticulocytes are released at the aggregate stage. Non-anemic cats have only 0 to 1% aggregate reticulocytes but may have as high as 10% punctate reticulocytes. With moderate to severe anemia due to blood loss or hemolytic disease, the healthy cat marrow increases the rate of erythropoiesis and releases aggregate reticulocytes, thereby raising the reticulocyte count. 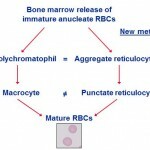 Since only aggregate reticulocytes are included in the count, the result is a fairly good indicator of the degree of the present marrow regenerative response. Furthermore, since aggregate reticulocytes correspond to polychromatophils in a Romanowsky-stained blood smear, the degree of polychromasia subjectively evaluated from such smears is a good surrogate marker for the extent of regeneration in the cat. Note that in mild anemias, cats may only release punctate reticulocytes. As for the dog, macrocytes, basophilic stippling, Howell-Jolly bodies and nRBC may be seen in the blood from cats with a regenerative anemia, but are not specific for the diagnosis (their absence does not preclude a regenerative response either). For instance, the presence of macrocytes, without polychromasia, in anemic or non-anemic cats may indicate that the cat was responding to the anemia in the last 21 days or had an anemia that was corrected in the last 21 days, but could also indicate the presence of other disease processes that cause macrocytosis, e.g. myelodysplastic syndrome secondary to feline leukemia virus infection. 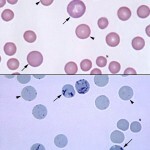 Punctate reticulocytes can be larger than normal red blood cells (macrocytes) but do not stain as polychromatophils in a Wright’s stained blood smear (they are normochromic). Punctate reticulocytes can persist in the circulation for up to 21 days and are often responsible for a post-regenerative macrocytosis in cats (i.e. the cat is macrocytic but no longer anemic). Normochromic macrocytes may also be seen in the blood of cats with poorly regenerative anemia due to primary myelodysplasia or acute myeloid leukemia, where they are a reflection of abnormal dysplastic (“megaloblastoid”) differentiation. Regenerative anemia in a horse. Polychromatophils are not seen in the blood of healthy horses and are not a reliable finding in horse blood smears in experimental studies of hemolytic or blood loss regenerative anemia (Radin et al 1986). 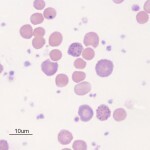 Reticulocytes can be counted in equine blood with newer fluorescent-based techniques (Cooper et al 2005), however, the observed increase in blood in this experimental study of regenerative anemia was quite mild (an average of 2,000 absolute reticulocytes/uL; the increase was more robust in marrow) and, in our experience, flow cytometric-based measurement of reticulocytes has not proven useful for distinguishing between naturally occurring non-regenerative and regenerative anemias in horses. In rare cases of severe, acute blood loss or hemolytic anemia, polychromatophilic RBC and some nRBC can be found in blood (Blue et al 1987, O’Neil et al 2014). The presence of nRBC in these horses likely reflects an altered bone marrow environment, bone marrow injury, or possibly altered splenic function than a regenerative response per se. The time for red blood cells to be produced in the marrow has been estimated at 4 days (Schalm’s Veterinary Hematology, 4th ed). The equine bone marrow is believed to release normochromic macrocytes more reliably in a regenerative anemia. This is because we see macrocytes in blood smears from horses (see image above), with corresponding increases in the MCV and RDW, with experimentally induced anemia in horses (Wu et al 1983, Easley 1985, Radin et al 1986). Macrocytes, in this context, are young RBCs that are larger than fully matured normal cells, but which stain as mature cells (i.e., are normochromic). These usually are the sole sign of regeneration in anemic horses. In one study, acute blood loss (40% loss over 2 days) and hemolytic anemia (with acetylphenylhydrazine) was induced in 4 and 2 adult horses of mixed breed, respectively. With blood loss, the PCV nadir was on day 7 and the RDW and MCV increased in each animal at day 14, peaked at day 21 to 28, and generally returned to baseline by day 42. However, the increases, although apparent when compared to baseline results in individual horses, were infrequently above our current established reference interval. In the animals with hemolytic anemia, the PCV had decreased by day 7 and bottomed out at day 21, with recovery of 61-75% of the original value by day 42. The RDW and MCV in both horses increased at day 14, with the maximum change occurring at days 14-21 in the RDW. The MCV peaked at day 21 in 1 horse and between days 28 and 35 in the second horse, and was still increased above basal levels at day 42 in the latter horse despite resolution of the anemia. The magnitude of the change in MCV was far greater in 1 horse and was larger in both horses with hemolytic anemia versus blood loss anemia, despite similar decreases in PCV, supporting that hemolysis induces a more robust response. In a pony with chronic blood loss, similar changes in MCV and RDW were seen, but were mostly delayed by one week. In contrast, a horse in which blood was induced acutely and then subjected to chronic loss (20% over 8 weeks) to create iron deficiency (presumptive, not confirmed by bone marrow aspirate), the horse became anemic at day 35 with a mild increase in RDW, but the MCV actually dropped at this time and remained low until day 56, supporting release of smaller, presumably iron deficient, cells (Easley 1985). Because the MCV and RDW changes were mild and not above our current established interval, particularly in horses with blood loss, the MCV and RDW cannot be relied upon alone to evaluate regeneration. In another experimental study of acute blood loss and acetylphenylhydrazine-induced anemia, the HCT declined to an average of around 19% by day 14 and around 22% by day 10, respectively. The average HCT was within reference intervals by days 28 and 48 and had returned to baseline values by days 40 and 78, respectively. The mean MCV increased in horses with hemolytic anemia and was above or at the upper reference limit between days 21 and 50, with individual horses having higher values up to 78 days. With hemorrhagic anemia, the mean MCV did not increase above the upper reference limit (Radin et al 1986). Changes in the RDW were less consistent in the latter study, with only individual horses with hemorrhagic or hemolytic anemia having high values. Only transient increases in the average RDW were seen between 21 and 42 days in the hemorrhagic group and between days 18 to 32 in the hemolytic group. When macrocytes are numerous enough, they will increase the RDW and MCV above the reference interval. A high MCV may be seen for a few weeks after resolution of a hemolytic or hemorrhagic anemia (Wu et al 1983, Easley 1985, Radin et al 1986). Bone marrow examination can be used when peripheral blood changes are less than clear as to the nature of the anemia. An erythroid hyperplasia (and > 5% reticulocytes in the bone marrow [Wu et al 1983]) can be seen in response to a peripheral anemia, however due to the invasiveness in this technique, this is rarely done to confirm a regenerative response in the marrow. In addition, the reliability of this technique has not been shown with certainty. Note that macrocytes are not specific for a regenerative anemia in a horse. There are other mechanisms of macrocytosis (e.g. abnormal bone marrow production) and these should be considered before ascribing macrocytes to a regenerative response in this (or other) species. We can also perform sequential hematocrits (assuming no changes in hydration status and the original cause of the anemia has been rectified) to determine if an anemia in equidae is regenerative. No reticulocytes or polychromatophils circulate in blood in non-anemic ruminants. Polychromatophils (and reticulocytes) are found in blood of anemic ruminants in acute blood loss or hemolytic anemias and indicate a regenerative anemia. Quantitation of reticulocytes can be done but does not provide a large amount of additional information. 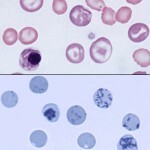 The essential information that there are young red cells circulating in blood in an anemic ruminant can be derived from the routinely stained blood smear, in which polychromasia, macrocytes, basophilic stippling (which can be quite prominent and occurs in mature, macrocytic, polychromatophilic RBC and nRBC), and Howell-Jolly bodies may be seen. Some nRBC may be seen in the blood of ruminants with a regenerative anemia, however, alone, these cells are not specific for regeneration. We have seen nRBC in blood of calves with mild anemia or no anemia, but no features of regeneration (polychromatophils or macrocytes) with lead poisoning. The presence of macrocytes alone, without polychromasia, particularly when accompanied by basophilic stippling, is considered to indicate a degree of regeneration in ruminants, however the regenerative response is considered weak in this setting (polychromatophils indicate more robust regeneration). As for all other species, macrocytes can be a feature of other diseases (e.g. cobalt deficiency) so their presence does not always indicate regeneration. Camelids, like other ruminants, have no evidence of polychromasia or reticulocytes in blood in health. Camelids do release reticulocytes (observed as polychromatophils) and macrocytes (may or may not be punctate reticulocytes) in a regenerative anemia, however camelids respond poorly to blood loss anemias, mounting a poor regenerative response. It can take camelids weeks to months to recover from a bout of blood loss. The reason for this poor bone marrow response is not known. Nucleated RBC can be seen in the blood of camelids with a regenerative anemia but these cells can also be seen in very high numbers in non-anemic camelids. The presence of nRBC without polychromasia, should not be considered evidence of a regenerative response!! Unlike other ruminants, basophilic stippling is also not a prominent feature of a regenerative anemia in a camelid.